The Nokia 8 doesn’t just herald Nokia’s return to the world of luxury smartphones, it’s also the start of a new era in smartphone photography. Forget about the selfie, the ‘bothie’ marks a new way to record memories, and tell both sides of the story. What’s a bothie, and how does it work? Bothie photography is a new way to capture photos and video on the Nokia 8, using its Dual-Sight camera mode. 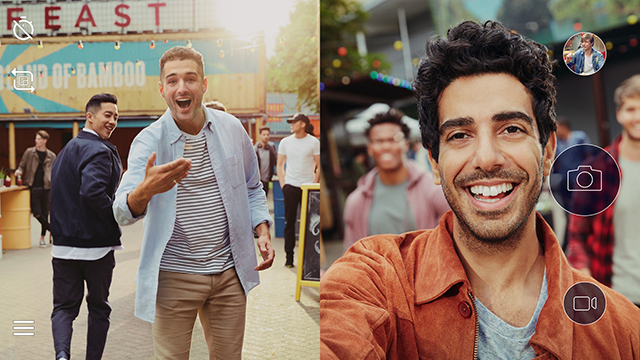 Dual-Sight – the proper technical term for it – uses the Nokia 8’s front and rear 13MP camera lenses simultaneously to present a split-screen image, or video of you and your subject. So you end up with more than one view, just like the image below. Dual-Sight photography on the Nokia 8 could change the way we capture, and share special moments. Here are just some of the ways you could use it to capture bothie-style photos, and video. If you love to share a selfie or two of you and your loved one, your BFF, or even your beloved pet, then try taking a bothie instead. It’ll capture both of you in the same split-screen frame, for a truer recollection of that special moment when you made someone laugh, or cry tears of joy. Add more zest to food photography by capturing your reaction to your favourite, or not so favourite dishes. It’s a potentially new way to review restaurants on your Instagram food page. Send the perfect ‘wish you were here’ picture postcard that lets you get more of the scenery in the shot. Or record a video of yourself in exotic surroundings, with an unobstructed view of what you’re looking at. Your football team is about to take a last-minute penalty to win the game. With Dual-Sight, you can record the moment the ball hits the back of the net, and capture the spontaneous roar of the crowd at the same time. Seeing a child taking their footsteps is a joy for any mother or father. Make the most of it by using the Dual-Sight mode to record this precious moment. In split-screen you’ll be able to relive your own emotion, as well as those first tentative footsteps side-by-side. If you’re a YouTuber, or Instagram regular, bring your social media followers closer to your story with a split screen video of yourself and your surroundings. It’s a more personal way to connect with your audience, without taking anything away from the action.